There are exciting updates at the Clara Barton Missing Soldiers Office (CBMSO) Museum in Washington, DC. The CBMSO would like to welcome new staff members to the Museum. Emily Peikin transitioned from a summer internship at the National Museum of Civil War Medicine (NMCWM) to become a Guest Services Representative at the CBMSO in September 2014. She is currently an undergraduate History major at American University. Sara Florini, Acting Site Supervisor, also joined the CBMSO team in September 2014. She previously worked at the Clara Barton House in Glen Echo, MD, and possesses extensive knowledge regarding Miss Barton’s life and humanitarian work. Emily Dean, Store Manager, has been a part of the CBMSO since the Museum opened for guided-tours in March 2014. The CBMSO Museum also employs a dedicated volunteer docent staff. If you are interested in becoming a volunteer, please visit our website or stop by the Museum in person to fill out an application today! Volunteers are critical to the Museum’s mission to educate the public about Clara Barton and her legacy of humanitarian work. Recently, the Museum ventured further into the world of social media. If you would like to learn more about our organization, “Follow” us on Twitter @CBMSO and “Like” us on Facebook. In addition, the Museum operates a Go Fund Me page where visitors can directly help the CBMSO raise money for an artifact security system! On October 13, 2014, Museum staff attended a tour of the collections room at the NMCWM in Frederick, MD—the main operating museum of the CBMSO. 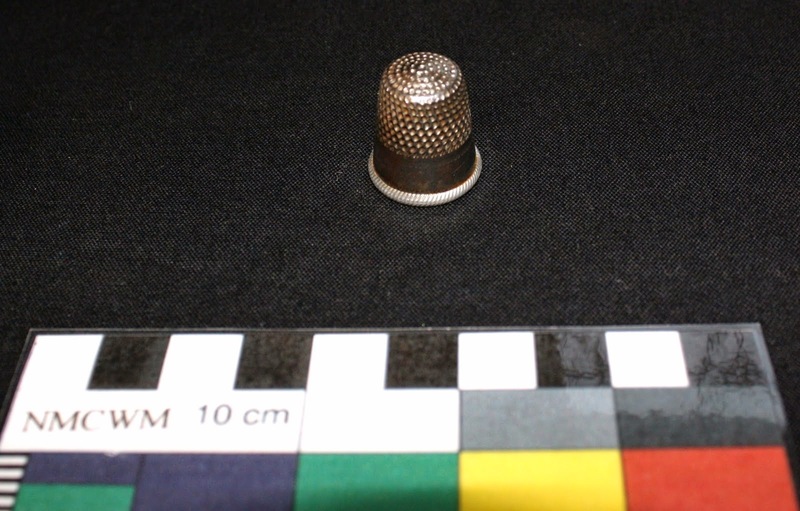 During the tour, staff members had the opportunity to view a variety of pertinent artifacts, including the CBMSO black & gold tin sign, a rubberized shelter half, as well as a steel sewing thimble found in Room 12 of the museum. 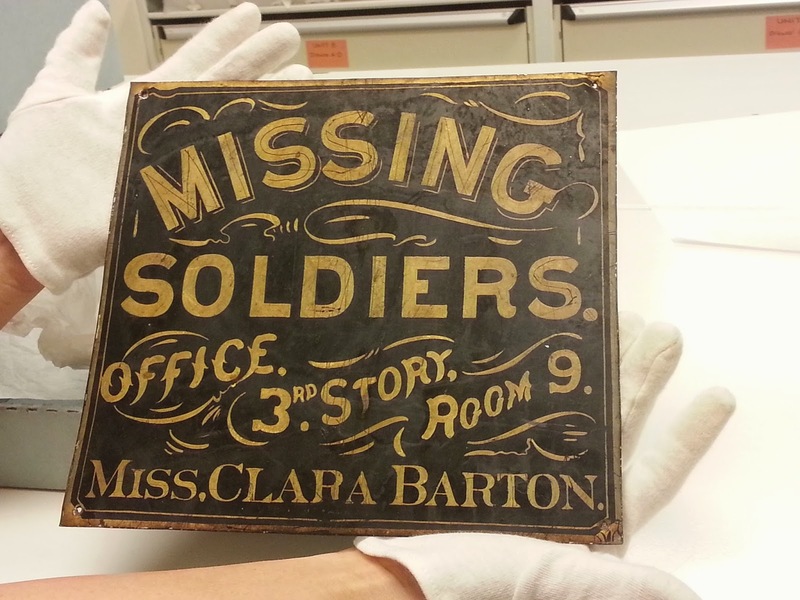 The “Miss Clara Barton, Missing Soldiers Office” tin sign welcomed military families to 437 7th Street, NW, Washington, D.C. from 1865-1869. Without this artifact, Mr. Richard Lyons, a contractor for the General Services Administration (GSA), would not have been able to save the CBMSO from demolition in 1997! Why did Clara Barton have a rubberized shelter half in her possession? Traditionally, the Army issued rubberized tents to officers and generals to help shelter them from rain on the battlefield. Due to the short supply of waterproof shelters, Enlisted men received canvas tents. Somehow Clara Barton managed to obtain the rubberized shelter half seen in the picture above. The Museum speculates that Miss Barton used the shelter half to protect her medical supplies on the battlefield. Powdered medicines like morphine and opium were useless to wounded soldiers if they got waterlogged. The CBMSO rubberized shelter half is incredibly rare; it is one of few surviving Civil War Era shelters. ©National Museum of Civil War Medicine. Socks are property of the U.S. General Services Administration. In addition to lacking dry shelter and blankets, Civil War soldiers lacked clean clothes. As a supplier during the Civil War, Clara Barton supplemented soldiers’ rations by providing them with food, clothing, medicine, and other supplies. This included socks, which were crucial during long winters and grueling marches. 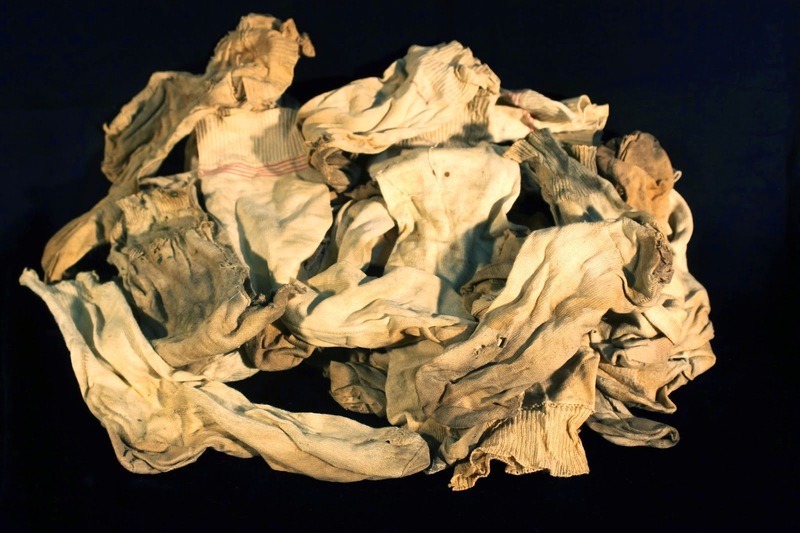 Lyons discovered a large pile of bloodstained socks and sewing materials in the attic and rooms of the Missing Soldiers Office in 1997 (READ MORE HERE). The Museum speculates that Miss Barton mended and washed the bloodstained socks before sending them back to active soldiers on the front. The CBMSO Museum is looking forward to displaying the tin sign, rubberized shelter half, and sewing materials in a proper climate controlled and secure exhibit environment on the third floor. Other potential artifacts for display include: medicine bottles, documents, clothing, letters, and original wallpaper rolls. 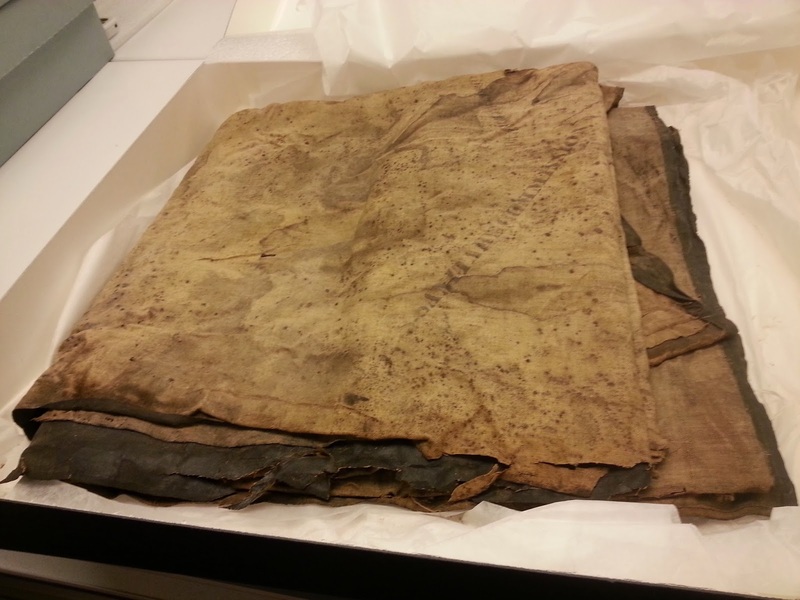 It is truly a special privilege to be face-to-face with 150-year-old history! The CBMSO Museum is undergoing multiple renovations within the third floor boardinghouse space. Recently, a historical light technician finished installing special LED lights, which simulate gas lighting throughout the museum. In addition, GSA contractors are working to replace the current pine floorboards with historically accurate reproductions. Contractors are also in the process of restoring original CBMSO windows along the inside courtyard of the building. They also plan to add a doorway connecting the first floor lobby to the staircase that leads to the third floor.